The North West Warriors have named their squad that will travel to La Manga at the end of the month for the first round of this year's Interprovincial tournament. The three teams will play each other in a series of 50-over games at the Spanish venue as a curtain- raiser to the domestic season. Ian McGregor's 13-man squad is a blend of youth and experience with no fewer than seven Internationals making the trip including Boyd Rankin and William Porterfield. Craig Young, Stuart Thompson, David Rankin, Andy Britton and skipper Andy McBrine make up that septet, giving McGregor a real experienced spine to the line-up. Graham Kennedy, Aaron Gillespie and Ross Allen will be back in the Departure Lounge after successful winters playing in Australia, while many will be delighted to see William McClintock also making the cut. Marcus Poskitt is in as well; the former Coleraine player being given his chance after impressing in the Warriors winter training set-up. With Niall O'Brien's retirement, Poskitt is likely to contest the keeper/batsman role with Andrew Austin who is also included. Davy Scanlon is the most noticeable absentee although Bready's title-winning skipper will travel as an Assistant Coach rather than in a playing capacity. This role was filled last year by Stephen Smyth and Niall McDonnell. The squad will have little time to enjoy the sights however, they will fly out from Dublin on Easter Sunday arriving at their hotel late in the evening. 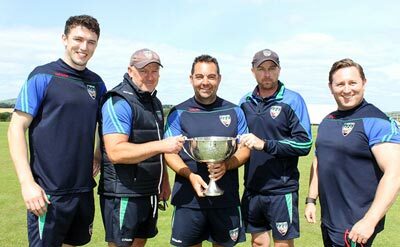 The Warriors will play their first game against Leinster Lightning on Monday morning, will train on Tuesday and then play the Northern Knights on Wednesday before heading home on Thursday morning. One downside for the North West team is that William Porterfield is suspended for the first of those two games following a Level One offence in last year's game against Leinster Lightning. Head Coach McGregor refused to be drawn on that issue, instead suggesting that he felt this was an ideal opportunity for his side to buck the trend in this format. "Since the Interpros have started I feel the 50-over game is the one where we've been slightly disappointing. It's surprising given that this is our bread and butter but hopefully if we get a bit of sun on our backs, we might be able to turn things around a touch. "It's a very tight schedule, but that's the way things are at this level. It's also why we spent so much time on our strength and conditioning over the winter- something that stood us in good stead last year. "There's also a good opportunity for the squad to bond over the four days. That was an area of real strength for us last season. "This is a really good group and they enjoy each other's success. We're looking forward to it," he concluded.